" Bhagawanukku preetiyaa avar amaichundu irukkar. En kaila enna irukku?" And after asking for the ingredients, he told them and I tried as told by him. 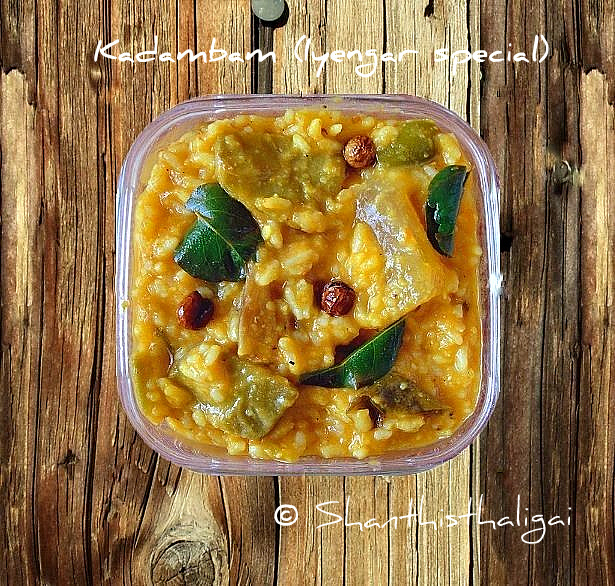 This is a popular iyengar recipe, a famous prasadam in Perumal temples at Tamil Nadu & Karnataka. It is a traditional iyengar recipe in which onion and garlic are taboo and often made at home too. Generally, people misunderstand this rice with the kadamba sadham, as mixed vegetables are used. This DIFFERS from the regular kadamba sadham and sambhar sadham. Onion, garlic, tomatoes, coriander leaves, english veggies like beans, carrot, potatoes, whole spices such as cinnamon, cloves etc. are AVOIDED in this recipe. Bengal gram - 2 tsp. Soak kondakadalai in water overnight. Pressure cook rice and toor dhal with turmeric, mash well and keep aside. Cook kondakadalai in a separate vessel alongwith little salt while cooking rice and dhal. Keep aside. Extract pulp from the tamarind. Cut vegetables into big pieces. Soak toor dhal and red chillies in water for 1 hour. Drain the water completely and grind to a coarse paste alongwith salt. Heat oil, add this paste and saute well till the colour changes , shape into amla-sized balls and steam cook till done. Keep aside. Heat a spoon of ghee and fry sundakkais till dark brown. Keep aside. In a pan, heat a teaspoon of oil and add the items (given in the list" To Powder"(except coconut) until golden brown. Finally add grated coconut or dessicated coconut, fry till the coconut changes light brown. When cool, powder coarsely in a mixie. Keep aside. In the same pan, heat the remaining oil , add all the vegetables, a pinch of turmeric powder and stir fry for 3 minutes. Add little salt, pour in 1/4 cup of water and cover it with a lid. When half done add the tamarind extract and let it boil till the raw smell of the tamarind goes. Now add the mashed rice and dhal, cooked kondakadalai, paruppu urundais, sundakkais, the ground powder, remaining salt and mix well without any lumps. Add enough water to get the desired consistency and cook for 3-4 more minutes stirring frequently. Temper with the ingredients (given in the list "to temper") . Finally add a spoon of raw gingelly oil. Serve hot with any vadaam or poricha appalam. VARIATION: With or without cooked tur dhal. Hai Shanti..this is indded a new recipe for me..really interesting. Thanks for sharing. I will try this asap. Knowing that sambhar sadam is a favourite here at home, this will surely make a nice variation to that. An addition to the variety rices. Your recipe reminds me of kadambam given in Panchavadi Anjaneya temple every Sunday. Interesting recipe & yummy clicks!! what is dry sundakkai? This is like combining the veggies of aviyal with the flavour of sambar - totally yummy. Can't wait to try. looks super delicious. Nice dish. New recipe to me, would love to try it soon! Thanks for sharing! tis is a really authentic method of kadamba sadham.. bookmarked..
New recipe to me,will try it soon,thxs for sharing akka!! Adding paruppu urundais to the rice is new, the rice looks delicious..
Wow! Looks tasty. And different from sambar rice. looking at the kadambam sadam I am drooling.This dish is healthy and different with lot of interesting ingredients. Nice one! This is something new to me. I came across this recipe today. Isn't this the same dish we prepare on the Kanu festival for the girl child in the family?